Two girls from an Amish community in upstate New York disappeared from their family’s roadside stand in Oswegatchie, New York, on Wednesday, and authorities believe they were abducted. 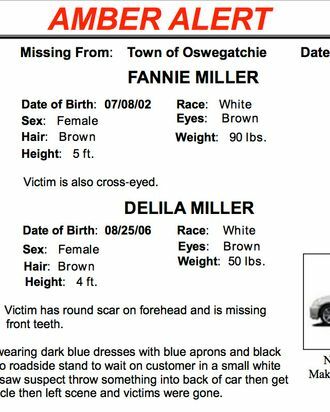 State Police have issued an Amber Alert in St. Lawrence County for 12-year-old Fannie Miller and 7-year-old Delila Miller, who were last seen waiting on a customer driving a white, four-door sedan. According to the AP, the girls were wearing dark-blue dresses with blue aprons and black bonnets.